A man cave is a male sanctuary, such as a specially equipped garage, spare bedroom, media room, den, or basement. It is a metaphor describing a room inside the house where "guys can do as they please" without fear of upsetting any female sensibility about house decor or design. Paula Aymer of Tufts University calls the concept of the man cave the "last bastion of masculinity". Many guys dream of having a place of their own. Elvis had his Jungle Room, and Thoreau his 10x15 foot home on Walden Pond. Even our heroes have them - Batman has the Bat-cave, Superman his "Fortress of Solitude", and Iron Man inventor Tony Stark has his garage full of expensive toys with computerized aide Jarvis. For regular guys, a man cave usually gets carved out from unused or unwanted space. A spare bedroom, part of the garage, cellar, or the garden shed out back are all spaces of manliness which can be converted into a man cave. Given time, money, or effort, a man cave can be created as simply as a lounge chair in a quiet room, a mecca of teched out gadgets and electronics, or perhaps a dramatically designed whole basement mock-up of a hunting lodge in the woods. No matter the space, man caves give guys a place to escape and spend time in solitude, or in the company of other "like-minded" men. I love the idea of a man cave, but I think there is a better way. Read on below as I list just some of the ways men would be better off with a Recreation Vehicle, or RV, than investing in a man cave. RVs, come in all shapes, sizes, and can fit every budget. Popups, trailers and motorhomes all can become your man cave. No matter new or used, you get to make it your own. What's nice about all RV's - they come equipped with whatever you need! A bathroom, running water, place to lounge. 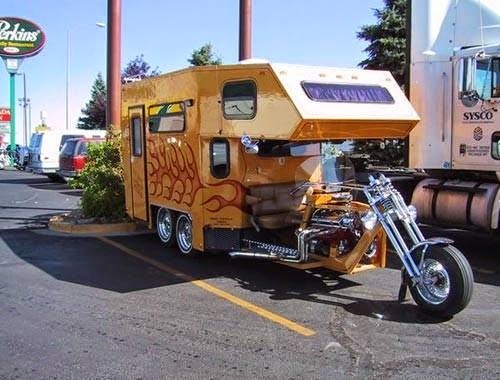 You don't have to add a lot to an RV for the fun to begin. The basics are already included! A man cave is usually four walls. You get to pick the decor, but there's plenty of work and time to invest to get to all the amenities an RV starts out with. Installing the plumbing, electric, and electronics in your usual RV wold take both time and money. An RV has enough of what you need to enjoy right away, and still add on your favorite decor or tech to include your favorite hobbies or sports. Since I live in the city, we store RoadAbode in a storage facility outside the city. It's nice to go out and relax, run the generator, watch a movie, listen to music, or read. Other times it's fun to work on RoadAbode for our next adventure. 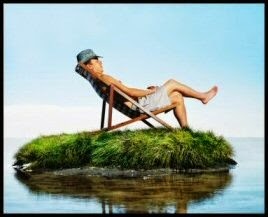 Either is a great way to relax and restore. Whatever your like to do, an RV is there for you. For sports, RVs make a parking lot tailgate party great. If you like to motocross, ride ATVs, mountain bike, or snowmobile, Toy hauler RVs have space to bring them along. If you enjoy the simplicity of fishing, your RV becomes your stream-side fishing camp. Want to be in the middle of a NASCAR race? Join the other RVing fans and be part of the excitement camped on the infield. If all you want to do is watch the sunrise or sunset. your "Man Cavemobile" will not only get you there, but allow the experience in comfort. A converted shed, attic, or other space can be changed by what tech or interior decor changes you make. What is awesome with any Recreational Vehicle - just take it to a different spot to change your perspective or view. One of the best times with buddies I had was taking RoadAbode to camp at a car show. We could check out the various cars, relax and use RoadAbode as a base camp. We also hit a local raceway and found a great local barbecue place. All that would not been possible with the usual idea of a stationary man cave. Whether you are happy with microwave popcorn, a brat on a roll, or want to create gourmet meals, an RV has you covered. Most RVs have gas cook top, electric microwave, and regular or convection oven, or at least a combination of two. A refrigerator for your favorite brew, and freezer in case you want to stock up on some Ben & Jerrys "Chubby Hubby" ice cream are standard. So whether you tend to be a simple snack-a-holic with a craving for some microwave popcorn, or enjoy making a multi-course gastronomic event, your RV has a full kitchen ready and waiting. Unless you built it into the budget, most man caves have to share the cooking area with the rest of the household. If you need help cooking in your mobile man cave this book would be worth a read. Manly recipes for tailgaters, beer enthusiasts, sportsmen, fisherman, hunters and more. If you're looking for recipes for these "manly" occasions, you'll find plenty of great options in this testosterone-laden cookbook. Falling asleep in a barcolounger or sofa is OK, but wouldn't you rather be able to just full-fledged sprawled out nap in a bed with your man cave? When selecting furnishings , your wife may raise an eyebrow at a bed going into your man cave. An RV usually not only has a full, queen, or even king size bed, but many times the couch or dinette convert into a sleeping area too! For that real "cave" feel, Class C RVs have an overhead bunk that can give a more closed in feel making it your own "man cocoon". Some RVs today even have mattresses that will adjust the firmness level. Pretty cool for your man cave-mobile. Extra beds can come in handy for a guys weekend. Some RVs can hold up to eight people, but most would be comfortable to include four to six.guys. 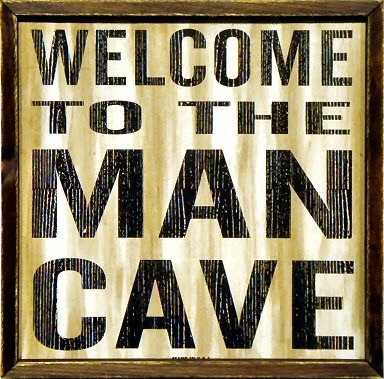 Invite the guys for a "man cave sleepover" in comfort, and in a location that complements your interests. Many RVs already come loaded with large screen TVs, DVD or Blue-Ray players, Hi Fidelity speakers systems, and even satellite systems. Larger A Class (Bus looking) RVs even have media centers outside for those tailgating opportunists. You can start simple and upgrade as you want or can budget. For RoadAbode, I've utilized and upgraded to an led TV, incorporated WiFi, and even upgraded speakers to include a sub woofer to give the feel of being in action and adventure movies.. It's pretty cool when we can watch a streaming movie over our data plan, and pausing it to go check on the crab trap at the dock alongside RoadAbode. It really is a glorious mix of man cave and RV lifestyle! If you have to run out from your man cave right past your kids room which is full of "Frozen" posters when you have the need to pay a visit to the bathroom - aka -"manhole", doesn't that kill the whole man cave vibe? The beauty of having an RV is it has a complete bathroom, with running water, even if you are getting solitude in the middle of nowhere without ANY outside water hookups. An RV has tanks and a pump for fresh water, and holding tank for waste water. There is also something satisfyingly manly about the whole process of emptying your black tank when needed. Connecting the hoses, hooking up to the sewer and the whole "dumping" process is, well cleansing, in almost a calming way. Plus, what man doesn't look at his poop? All kidding aside, an RV has the convenience of a toilet, sink, and even a shower only a few steps away. And it does help to have the vent cap with an exhaust fan right there to help air out the area. Lots of people believe that a man cave is a selfish use of space, and for some families that could be true. It does take up space that could be a kids bedroom, or playroom. The gardening tools still need to go somewhere if the man cave has taken over the shed or part of the garage. Or, maybe you try to have the space "designed" as a dual use spot in the house. Have you seen what happens when your kids start using your man cave? Do they leave lego and board-game pieces in the middle of your floor? TV always on the Nickelodeon Channel? With your RV man cave, you can still use for the family - on your terms. When you schedule family vacation time, or bringing your buddies along for the guys weekend, it's a win to all involved. Welcome to being the hero! Treat the soccer team and let the kids ride in style to the game, then during the game offer up the other dads an "adult beverage" and a chance to relax or catch up on your favorite teams scores. With an RV you can enjoy solitude, guys time, and family time. You can share the space and the possible fun times easily. Your RV man cave can serve both family, and friends. The best part of having an RV over a man cave are the ever changing vistas it can provide. 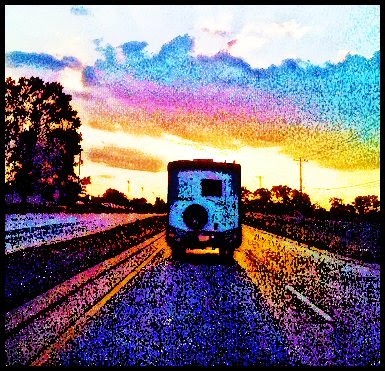 While driving down the road, or once at a destination, everyone can enjoy the beauty and scenery.. I've had RoadAbode parked along mountain streams, lakes, and ponds. Nestled in groves of trees or nearly beneath a roller coaster. I've set up camp by the beach, along docks, and even near the mouth of a cavern. Even when it's not the most beautiful of views, it's still unique or different than home. Only a man cave on wheels can give so many perspectives. And if the view is really that displeasing, just move along down the road, and explore the next highway exit or meandering backroad. So if you are thinking about taking that unused spare bedroom or the dingy corner of garage and calling it your space, think bigger. Think better. Think what you could do with a new or used RV. Think about the fun with your guy friends, Explore into taking your man cave dream on the road. If you have an RV already, I'd love to hear how you make it your personal man cave in the comments below. Happy RVing!